이상주, 김정순,(2016).한국형 노인자살위험 사정도구 개발.대한간호과학회지,46(1),59-68. Purpose: Increase in suicide rate for senior citizens which has become widespread in our society today. It is not a normal social phenomenon and is beyond the danger level. The contents of this study include Korean senior citizens" suicide related risk factors and warning signs, and the development of a simple Geriatric Suicide Risk Scale. Methods: This study is Methodological Research to verify reliability and validity of the Geriatric Suicide Risk Scale according to the tool development process suggested by Devellis (2012). Results: For predictive validity assessment, high suicide screening accuracy was showed with an Area under the ROC curve (AUC) of .93. For the optimal cutoff point of 11, sensitivity was 93.9%, and specificity, 75.7% which are excellence levels. Cross validity for assessment of generalization possibility showed the Area under the ROC curve (AUC) as .82 and in case of a cutoff point of 11, sensitivity was 73.7%, and specificity, 65.9%. 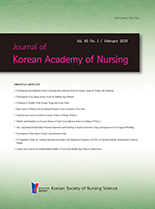 Conclusion: When it comes to practical nursing, it is significant that the Korean Geriatric Suicide Risk Scale has high reliability and validity through adequate tool development and the tool assessment step to select degree of suicide risk of senior citizens. Also, it can be easily applied and does not take a long time to administer. Further, it can be used by health care personnel or the general public. Beck AT, Schuyler D, Herman I. Development of suicidal intent scales. In: Beck AT, Resnik HLP, Lettieri DJ, editors. The prediction of suicide. Bowie, MD: The Charles Press; 1974. p.45-56.